One of the world’s most fascinating archaeological sites, the ruins of the ancient Roman town of Pompeii are one of the top spots to visit in southern Italy’s Campania region. 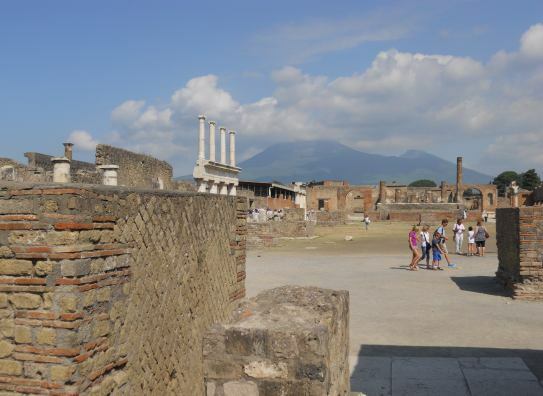 Just outside Naples, the ruins of Pompeii are located in the shadows of Mt. Vesuvius, the powerful volcano that destroyed the town. Walking through the ancient gateway leading into Pompeii is like stepping back in time – nearly two thousand years back in time to be exact. Frozen in time by the violent eruption of Mt. Vesuvius in 79 AD, the archaeological excavations at Pompeii allow a unique opportunity to see an entire Roman town, complete with villas, theaters, shops and temples. Perhaps the most impressive sensation that comes from exploring the ancient homes and walking the streets is the feeling that you’re catching a glimpse of daily life for the ancient Romans that called Pompeii home. 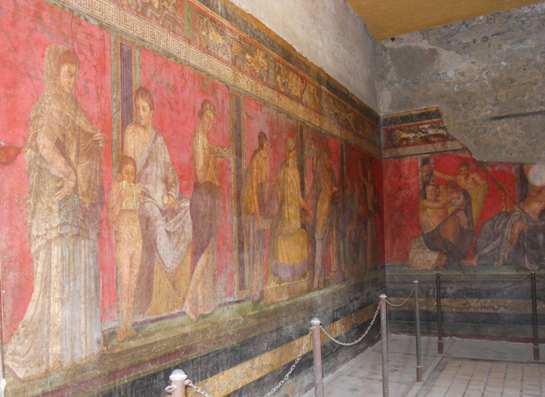 Visiting the villas of Pompeii is one of the best ways to see how the ancient Roman’s lived. 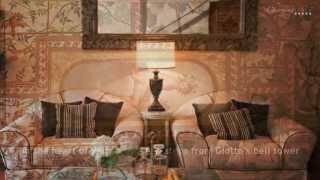 Beautiful artwork has been uncovered in many of the villas, including brightly colored frescoes, beautiful sculptures and finely detailed mosaics. 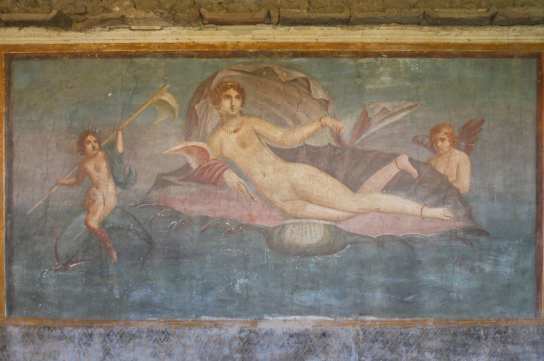 Step inside the House of Venus in the Shell and you’ll find a lush garden and a gorgeous fresco of the goddess Venus reclining in a seashell (pictured above). Mt. Vesuvius hasn’t been the only source of danger for Pompeii. The archaeological area also suffered damage from bombing during Word War II, including the House of Venus in the Shell. This house was damaged in 1943 by a bomb and was later uncovered in 1952. Exploring Pompeii, you’ll happen across shops where the people of Pompeii worked, food shops where they ate and theatres where they went for a bit of entertainment. 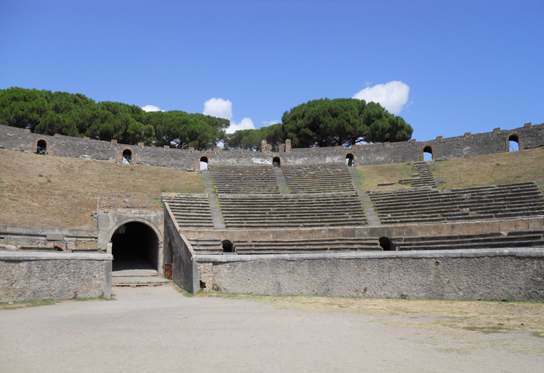 At Pompeii you can visit the Teatro Grande and Teatro Piccolo, the large and small theatres, where Romans enjoyed theater, dance and musical performances, as well as poetry readings. Located on the southeastern edge of the archaeological site is Pompeii’s impressive amphitheater, built around 70 BC, which once held over 20,000 spectators. The Orto Botanico (Botanical Garden) is a cool spot to stop, especially if you’re visiting on a hot summer day. 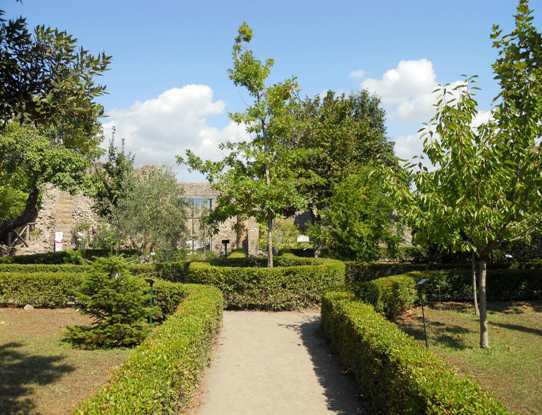 Here you’ll find a garden laid out according to the typical Roman fashion and featuring only plants that are known to have been cultivated in ancient Pompeii. This is a peaceful area that offers a look into how many of the villa gardens may have looked before the eruption of Vesuvius. Located on Pompeii’s central Forum, be sure to stop and see the Forum Granary, which once served as the town’s main produce market. Nowadays it is used as a storage area for many of the objects unearthed over the hundred of years of excavations. Peer inside and you’ll see rows upon rows of terracotta vases, architectural pieces and statues. You’ll also see some of the plaster casts made of the victims of the eruption, which is an unsettling and moving experience. Before leaving Pompeii, walk down the long Via delle Tombe, which is lined with many tombs, to the Villa of the Mysteries. This grand villa is named after an amazing series of frescoes (shown above) depicting a mysterious ritual scene. These frescoes are a reminder that there are so many things yet to understand and discover about life in this ancient Roman town. 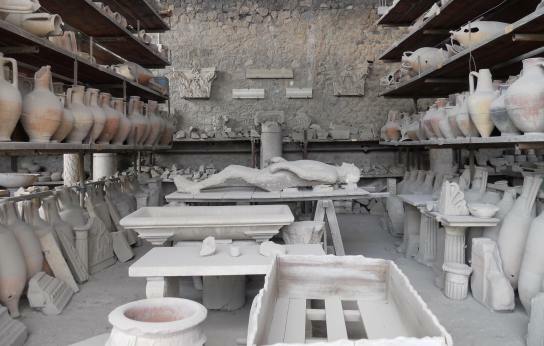 This is part of what makes Pompeii a captivating place to visit again and again. 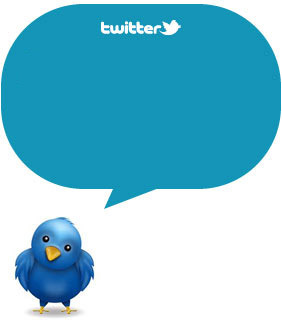 Subscribe to our RSS and follow us on Twitter and Facebook. Stay tuned! Thanks, Barbara! These are some of my favorite spots at Pompeii. But there is so much to see there! I try to explore a different area every time I visit. Thanks for stopping by! Such a divine tour, Laura. Thanks! Ciao Sharon! I'm so happy to hear that you had a fun time visiting Pompeii with your family. I think it's really a wonderful place to go with children, because it's so much more interactive and understandable than a museum. It's truly a place where history comes to life! Thank you so much for stopping by and for your nice comment. 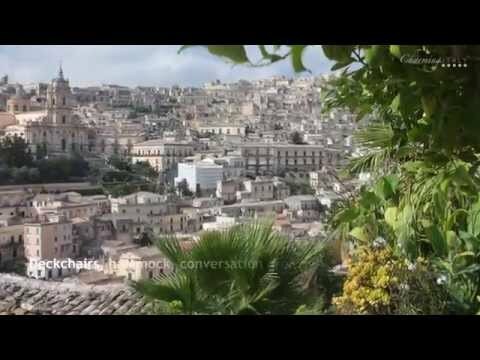 I hope the rest of your time in Campania was great!! Top 5 Italian Desserts: Traditional Sweets!